The need for protests challenging the Trump administration's destructive actions and their deceptive narrative have become even more glaringly apparent in the wake of the tragic murder of peaceful Muslims in a Quebec city mosque. 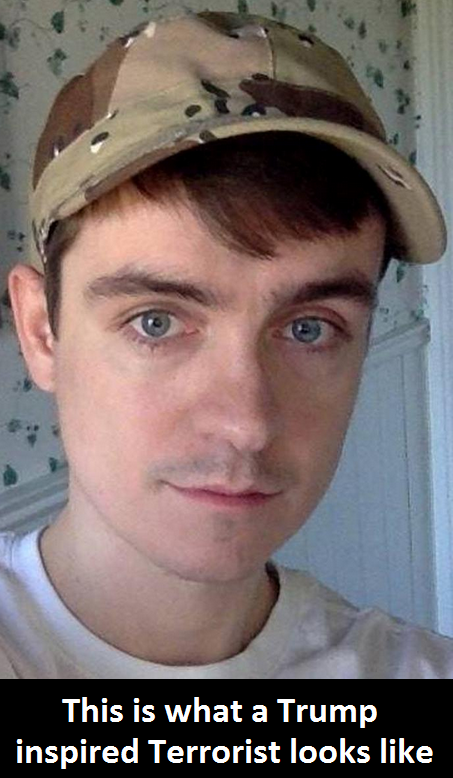 Look at the face of terrorism, note the pale skin and the light blue eyes. The man who committed this barbaric crime was not an ISIS sympathizer he supported Donald Trump and other racist nationalistic movements. This man is what is called in French "pure laine" literally meaning pure wool, referring to those whose ancestry is exclusively French-Canadian. As reported by The Independent, the killer's Facebook page indicates that he is a supporter of nationalistic movements including Donald Trump in the US, Le Pen in France, and the separatist Parti Quebecois. The Quebec City massacre killed six Muslims and wounded many others who were attending a mosque for evening prayers. The criminal whose name should be forgotten is a 27-year-old resident of Quebec. He has been charged with six counts of first-degree murder and five counts of attempted murder with a restricted weapon. "I wrote him off as a xenophobe. I didn't even think of him as totally racist, but he was enthralled by a borderline racist nationalist movement," Vincent Boissoneault, a fellow Laval University student, told The Globe and Mail newspaper. Trump has inspired hateful acts of violence before he was elected. Here are some of the hate crimes committed at Trump rallies during the election campaign and violence inspired by Trump before the election. After his electoral victory, there was another uptick in violent hate crimes. This is the demagogue who now leads the free world. In the alternate universe promulgated by Trump and his people, the homeland must be protected from outsiders. That may be the narrative that some white people want to hear, but the truth is that the real terror threat is not from Muslim refugees seeking to escape the horrors of war, these refugees have committed zero acts of terrorism and they actually have a lower incidence of criminality than Americans born in the country. According to Global Research, in both the US and Europe the overwhelming majority of mass shootings were perpetrated by non-Muslims. According to Charles Kurzman, Professor of Sociology at University of North Carolina at Chapel Hill, Muslim terrorism accounts for less than 1 percent of the 180,000 murders in the US since 9/11. Some of the deadliest terrorist attacks in the US were perpetrated by white people. In 1995 Timothy James McVeigh killed 168 people and injured over 600 in Oklahoma. In 2015 Dylann Roof killed 9 black people in a South Carolina church. In yet another example of twisted logic, the Trump administration used this attack to support their xenophobic policies including the Muslim ban which has been condemned by world leaders. As they often do, DT co-opts real world events that challenge his legitimacy and revises the facts so that they support his narrative. "We condemn this attack in the strongest possible terms. It’s a terrible reminder of why we must remain vigilant, and why the president is taking steps to be proactive, rather than reactive, when it comes to our nation’s safety and security," press secretary Sean Spicer said at his daily briefing on Monday. The fact remains that Bissonnette is a Trump supporter who shares Trump's disdain for Muslims. We cannot sit idly by and let the White House control the narrative. We must challenge their lies. Throughout his campaign, Trump lied repeatedly and even after being elected president he resorted to fake news with regard to Russia and he has attacked CNN dismissing the facts they report. We must oppose fake news and the darkness of Trump's post-factual narrative. Trump recently called the New York Times, the gold standard of fact-based reporting, "fake news" in a Twitter post. Donald Trump and his chief strategy advisor, a racist by the name of Steve Bannon are the real purveyors of fake news. What makes the situation even more troubling is that their deceitful narrative is now coming directly from the White House. Now more than ever we need to acknowledge the importance and the power of protest. We must not forget that Trump lost the popular vote by an unprecedented three million people. There were massive protests against DT after he was elected. This continued on inauguration day and was followed by the Women's March on January 21. It is important to note that the Women's March had a far bigger turnout than Trump's Inauguration in Washington, D.C., a day earlier. There are many who feel disheartened and beaten by the election of DT. However, we need to reflect upon what protest has accomplished. Consider what was accomplished through civil rights protests and the protest against the Vietnam war. More recently climate protests have helped to augur change on the world stage. The People's Climate March in September 2014 helped to create momentum that ultimately culminated in the historic Paris Climate Agreement. Almost half a million people and more than 1,500 organizations took to the streets in New York City to demand climate action as world leaders convened at the United Nations headquarters. There were 2646 rallies in 162 countries. The event generated more than 5000 articles and over 630,000 social media posts. The September 21st Climate March was the largest climate oriented march in history. There were a number of ground-breaking environmental protests that preceded it. In 2013 we were seeing signs of growing environmental activism and the beginnings of the new environmental movement. By the end of 2014 the people-powered environmental movement had come of age. In 2016 we saw how protest helped to kill the Dakota Access Pipeline. Previously, years of protest against the Keystone XL helped to create the support President Obama needed to cancel it. Activists are also responding to DT's crimes against the environment and assaults on climate. This includes his revival of the KXL and DAPL pipelines, his war against the EPA (including naming a climate denier by the name of Scott Pruitt to head the agency), the nomination of Exxon CEO Rex Tillerson as the Secretary of State. Recently, Greenpeace activists hung a massive, 70-by-35-foot banner reading "RESIST" from a crane only blocks from the White House Wednesday. Trump's Muslim ban has spawned ongoing protests in the US and around the world. Trump's wall rhetoric spawned massive protests in Mexico and when Trump visits the UK this summer he will be greeted by what is being described as "the biggest protest ever" (tentatively scheduled for July 1). This administration's is a kakistocracy and their unprecedented deceit warrants protest. There has never been a better reason to make our voices heard. Another People's Climate March is scheduled to take place on April 29th, 2017. It will be a global opportunity to protest Trump's war against science, climate and the environment. This protest will take place in Washington, D.C., in cities nationwide and around the world.